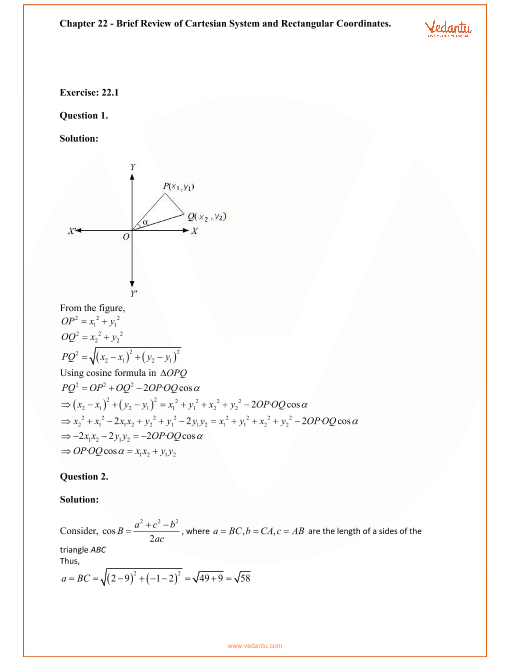 Free PDF download of RD Sharma Solutions for Class 11 Maths Chapter 22 - Brief Review of Cartesian System of Rectangular Coordinates solved by Expert Mathematics Teachers on Vedantu.com. All Chapter-22 Exercise Questions with Solutions to help you to revise complete Syllabus and Score More marks. Register for online coaching for IIT JEE (Mains & Advanced), NEET, Engineering and Medical entrance exams. In this Chapter 22 - Brief Review of Cartesian System of Rectangular Coordinates, several exercise questions with solutions for RD Sharma Class 11 Maths are given to help the students and understand the concepts better. At Vedantu, students can also get Class 11 Maths Revision Notes, Formula and Important Questions and also students can refer the complete Syllabus for Class 11 Maths to prepare for their exams to score more marks.